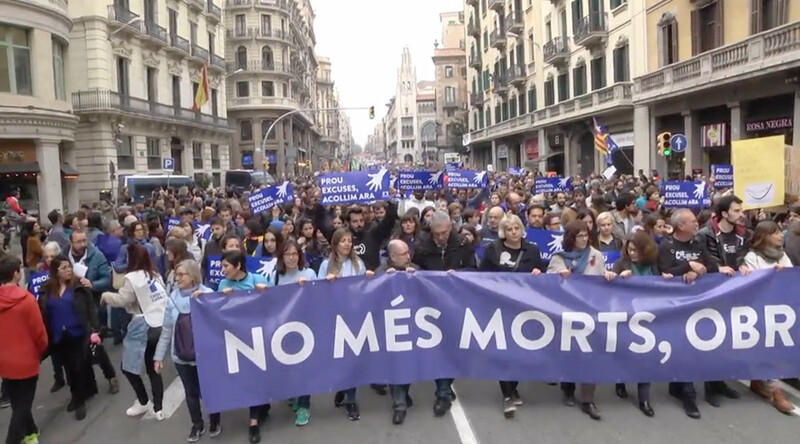 Up to half a million activists have flooded the streets of Barcelona demanding the government in Madrid lives up to the EU-set refugee quota and welcome thousands more of asylum seekers into the country. “Enough Excuses! Take Them In Now!” and “No More Deaths, Open The Borders!” slogans have been heard since 4 pm in Barcelona when hundreds of thousands gathered in support of the refugees. While Guàrdia Urbana, the municipal police, placed the number of protesters at 160,000 people, the organizers “Casa Nostra, Casa Vostra” insisted around 500,000 people attended the event. Footage from the scene showed crowds stretching for miles as thousands wearing blue clothes and holding blue banners walked from the center of the city to the Mediterranean sea, where scores of migrants perish trying to make it to Europe. The activists want Madrid to honor it's 2015 pledge to welcome 17,337 refugees in Spain by the end of 2017 from camps in Italy, Greece, Turkey and Libya. So far the country has only accepted some 1,100 refugees as part of the deal. Activismo - #VolemAcollir, manifestación multitudinaria. “There is an ample consensus in Catalonia to demand that the (government's) commitments are upheld,” organizer Ruben Wagensberg, told the Associated Press. While most Catalonians walked to influence the government’s refugee policy and honor the memory of those who perished at sea, some politicians used the occasion to hitch Catalonia’s sovereignty aspirations to the refugee debate. Òmnium Cultural, an association based in Barcelona, which has since 2012 actively demanded self-determination for Catalonia, called for “an own state” which will be “more supportive” and “able to host” more refugees, El Mundo reported. Historically Catalonia, which already enjoys significant autonomy from Madrid, has been one of Spain’s better-off regions and many of the local populace resent having to send taxes to the capital to help support poorer areas of the country. Catalonia accounts for one-fifth of Spain’s economic output and has had no problem in attracting foreign investment. 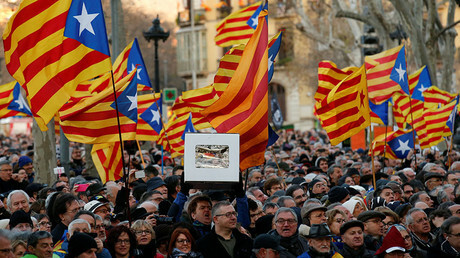 In November 2014, Catalans held a massive but symbolic regional independence vote, in defiance of the Spanish government’s ban. An overwhelming majority of participants, 80 percent, said “yes” to independence and secession from the central Spanish government in Madrid. Former Catalan leader Artur Mas, as well as former Vice-President Joana Ortega and former Education Minister Irene Rigau now all stand accused of civil disobedience for staging the vote in breach of a legal order from Madrid, which vowed to crush any attempt to stage a referendum.